Roger and Jessica Rabbit pose as a farmer as his wife for this pin series. 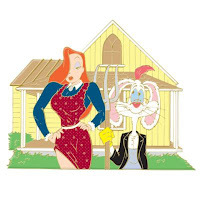 The pin is inspired by the famous American Gothic painting by Grant Wood. Jessica and Roger are in colonial-era clothing. Jessica is wearing an apron dress which is maroon with a blue shirt underneath with a white collar and cameo pin by her neck. Roger is wearing a black jacket, overalls and is holding a pitchfork. The background is the famous Dibble House which inspired the original painting.